Female Force is a series of one-shot comics each pertaining to a different successful female public figure. Some are more inspiring than others, but, all show the hard work these women put into their careers in order to reach the amount of success they have achieved. This issue narrows in on Michelle Obama and the dedication, and persistence that brought both her and Barack into the public eye. Biographer Neal Bailey hit a high note in this issue with a detailed, yet, simplistic explanation of Michelle’s life and her effect on the candidacy of her husband. Bailey does not over exaggerate any specific accomplishment of Michelle’s allowing you as the reader to take away what inspired you most versus what a writer has told you to be inspired by – something that is a great relief for me when reading biographical works. The issue begins with the election of Barack Obama as president, when he is presenting the now famous speech on change. This is where it takes an almost instant downhill slope into a explanation of how the biographer felt in this moment. A feature of this comic, needless to say, I was quite disappointed in. Although Bailey doesn’t spend a lot of time on his own opinions when they did come through I found it to be aggravating due to the unbiased view I was hoping to find. Another issue I had with the writing at this point was that other than a single photo of Michelle it is all about Barack. Introductions are the heart of a comic and when the intro is flawed, biased and not based on the sole character it gives great doubt to the rest of the issue making it very difficult to want to continue reading – especially in a biographical work. After several attempts, however, I had finally made it through and by the final page I was pleasantly surprised to find that I had, for the most part, enjoyed it. Michelle Obama is a Princeton graduate. Her senior thesis, which is constantly misquote and misinterpreted by it’s readers, discussed racial guilt in the black community between those who are poor and those more fortunate. Although she did not grow up in the wealthiest of homes, Michelle always gave back to those who were suffering and made a point of helping the black community realize it’s potential. In modern times many still carry racial slurs on their tongues, degrading and uninspiring those in the black community. This raises many issues as to how much success they feel they deserve, which in some cases may seem to be little, not allowing for them to reach their full potential. Michelle made it her personal mission to fix these problems, and has taken a big step for all by pushing herself to be the best person she can in order to inspire others. When Michelle had first met her future husband, Barack, she did her best to avoid and deny his advances. Instead of fleeing Barack decided that he would push himself to reach the high standards of Michelle and successfully did so. After only two years of dating, and cold-feet, Barack had finally proposed and they were to be married a year later. Michelle had left her job in order to spend more time helping others, despite the great pay decrease. She began to focus her time on reading to children, and promoting her husband in his political career. In 1998 Michelle had given birth to their first daughter Malia and later in 2001 their second, Sasha. The stress of having children and work began to eat away at Michelle and the absence of her husband, who was working at all times, put a major strain on the relationship. Although they struggled to cope, Michelle did her best to be understanding and learned to appreciate the time she did have with Barack. After years of hard work Barack was finally campaigning to become president. 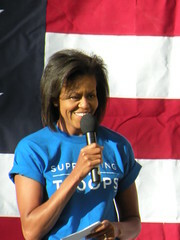 Michelle gave many speeches in encouragement of her husband and soon became a very well known public figure not only through her husbands success, but, through her own. Together they ran a very clean campaign and won over the hearts of America leading to the eventual presidency of Barack. Despite the early disappointment I had with this issue, it takes a major turn for the better merely a few pages in and hooks you from there. The writing greatly improves and begins to focus on Michelle instead of Barack, allowing for a greater understanding of her effect on his successes. The opinions and biases of the Bailey also deplete throughout the issue allowing the reader to take away what they wish from the comic. Overall, Bailey proves himself to be a skilled biographer through his choice in the events to discuss and the amount of detail he allows for them. The art, although very plain, breathes great life into Michelle’s story depicting every moment with clarity and details beyond the writing. The colours are very well done and original. I am a huge fan of line shading and Davies brings a fresh new perspective on this using techniques that appear very realistic despite their simplicity, leaving the art incomparable to other similar works. Michelle Obama did many great things in her time and judging by the fact she is still greatly involved in the American community I am sure she will do many more. I had very little interest, as a Canadian, in Michelle before this issue. I have, however, discovered my ignorance through this reading and was awakened to the dedication and hard work Michelle has put into her life and the lives of those who surround her. Female Force: Michelle Obama is worth a read for the inspiration alone, but, the strengths in the art and writing push it further into a must read category – especially for those as unaware of her significance as I was. Great review–really, really well done. I can’t say i’ve seen/read many non-fiction comics like this. I’m wondering wether there is a market for this kind of stuff? We’re so inundated with action, romance, sci-fi, fantast, et al. Some straightforward biogrpahical non-fic seems like such a refreshing idea to me. Lol–just another one of the reasons i have come to love independent comics! Such diversity! And I’m not entirely sure how good the market it for material such as this, but, I have a few friends who pick a lot of it up. I think the market for them just greatly depends on who it is about. As for indie, I have started to realize it is the best route to go. Everything I have read in indie comics has been very welcoming to new readers and old alike, something I find lacks in the main stream. People tend to treat main stream comics as , “Oh well I have been reading said comic for this long so I’m a bigger fan than you.” At least that is a lot of what I have seen in my community.